Keeping you comfortable in your home is the goal of Hankwitz Heating & Cooling of Ludington. They are a community-based company, orginally established in 1975. Owner David Hankwitz and his sister Cheryl Larson reopened the business in 2008, and with continued growth, now have a team of eight that are dedicated to providing only the best service to their customers. Thank-you to everyone who voted! In addition to David and Cheryl, Hankwitz Heating & Cooling is lucky to have Manager Tom Langfeldt. In addition to being licensed in all aspects of HVAC, Tom has a construction background and enjoys keeping up with the latest technologies. Lead Service Technician Kevin Nash is factory trained on Heil furnaces and air conditioning, as well as Dunkirk boilers. Other team members include lead installer Tim Hutchinson, installers and duct cleaners Pat Soper and Blake Hankwitz, Service Tech Dave Melin and Technology Specialist Matthew Hankwitz. 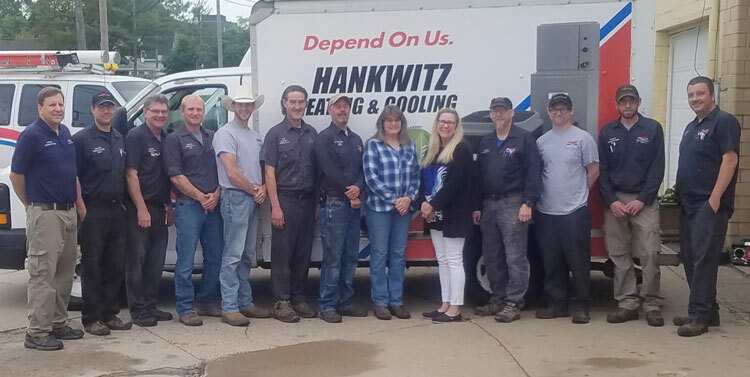 All together, their team has over 100 years of experience, and Hankwitz Heating and Cooling is fully licensed and insured. Hankwitz Heating & Cooling has been carrying the Heil product line for over 30 years. Heil gas furnaces are some of the best units you can buy...guaranteed to keep you warm throughout the winter. The experienced team at Hankwitz can have your new furnace installed and working in no time, whether you're buying one for the first time or replacing your old unit. Check out their selection of beautiful Napoleon fireplaces and gas logs, which adds beauty and a warm glow to any room. And to stay cool and comfortable in the summer months, have Hankwitz install a new Heil air conditioner. They'll work with you in determining the right size unit for your home, and you have the peace of mind knowing that your new Heil product is energy efficient and comes with a limited warranty. Ask about the split units by LG and Fujitsu. Other products offered at Hankwitz include Goodman furnaces and air conditioners, A.O. Smith water heaters and Viessmann boilers. Keep the air in your home as clean as possible, and have Hankwitz Heating & Cooling clean your ducts. They are the only ones in Mason County that use trailer duct cleaning, which features an 18 horsepower vacuum and offers superior cleaning. Doing the job right the first time is what Hankwitz is all about...they're not in business to get your money. They want to establish a good relationship with their customers, and they always have someone available 24/7 to take care of emergencies that crop up at the worse times! When it's time to consider a new furnace, fireplace, water heater, geothermal unit or air conditioner, go with the team that's been in business here in Ludington for over 30 years--Hankwitz Heating & Cooling. If you're not comfortable, they're not comfortable.